Ach filter set consists of two polarizing filters, one which can be rotated in its cell to adjust the brightness. The light transmission can be varied from 40% down to as little as 1%. Comes with sturdy plastic case-proect the eyepiece from dust and moisture. 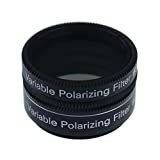 The 1.25Inch Variable Polarising Filter is a high quality anodized aluminium, optical glass variable polarising filter designed to reduce the amount of light entering your eyepiece. You can progressively dim the view when observing a bright object, such as the Moon or certain planets, to a level according to your needs, whilst increasing contrast, reducing glare and increasing the amount of detail that can be studied. The light transmission can be varied from 40% down to as little as 1%. This entry was posted in Astronomy Products and tagged 1.25, contrast, Detail, Eyepiece, Filter, Glare, Inch, Increasing, Optics, Polarizing, Progressively, Reducing, Solomark, Telescopes, Variable, View by Celestial World. Bookmark the permalink.